These French Gendarme helmets are formed of steel and were commonly used by French military police. Similar to U.S. steel pot helmets, They are equipped with a removable plastic liner with chin strap, and adjustable sweat band. Chin straps will either be leather, or canvas material. The leather chin straps are quite brittle and show their age. 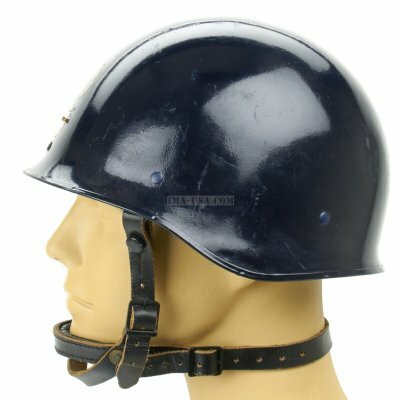 The shell is a dark navy blue color and will have some dings and scratches as most surplus helmets usually acquire throughout their career. We have added a USGI woodland camo cover with cat eye band. One size fits mosts.